Day 63: Bounce! Bounce! Bounce! Having been pretty much sedentary with CFS for a couple of years now, I’m conscious about the negative impact the lack of physical exercise is having on my body. To be honest, I’ve never been an exercise-loving kind of girl. I wasn’t sporty at school and to think how much money I’ve wasted on gym memberships in my lifetime… I’d go hell for leather until either I got an injury, or my routine was interrupted and I’d find it hard to get started again. When I lived in Australia, I enjoyed a couple of brisk daily walks along the beautiful coastal tracks, and riding my bike. I found being active in the great outdoors is much more suited to me than slogging it out in a gym. But it’s not always easy with the Great British weather! Over the last few months, I’ve been managing to enjoy short walking meditations and some gentle yoga. While these feel amazingly beneficial, I know I need to do something to raise my heart rate. So I’ve dragged my rebounder out of the garage, dusted it off, and am really enjoying the experience. NASA says rebounding is: “The most efficient and effective exercise yet devised by man.” And the list of benefits include stimulating the lymph flow, strengthening the heart muscle, and is gentle on the bones and joints. 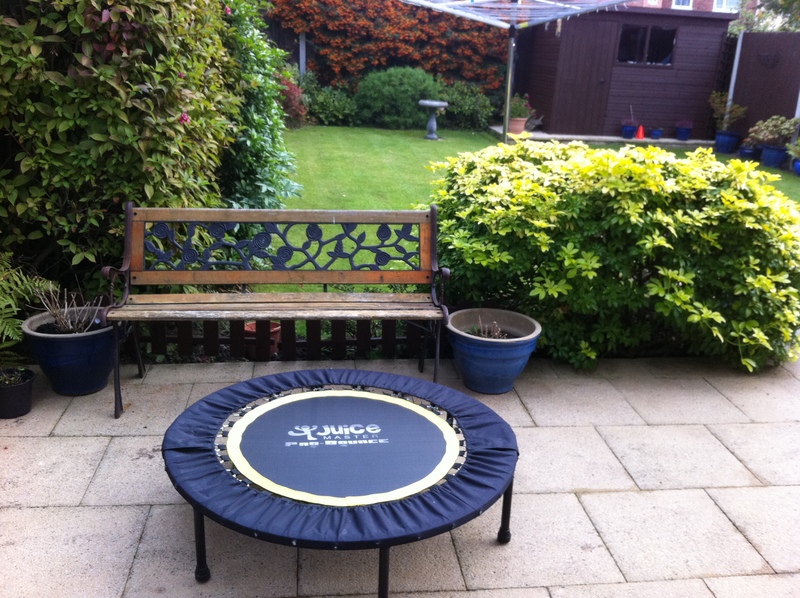 Keen rebounder Jason Vale, aka The Juicemaster, says: “The aim isn’t to bounce high or perform gymnastic tricks, it is to perform a series of small, controlled movements.” He has a Rebounding Workout DVD, which is way too energetic for me at the moment, but I’ll get there in time. There’s no rush. On my good days, healthwise, I try to have a little jump up and down for a few minutes. I’m thankful I can choose the effort I want to put into it, from low-impact side-to-side bouncing, to gentle jogging, to full-on jumping up and down, star jump style ☆. And WooHoooooo….. it is sooooooo much fun. I actually giggle my way through it. There’s something so playful and childlike about this form of exercise. It doesn’t really feel like exercise at all, bonus! I’ve created a playlist called ‘Bounce’ which is full of happy, uplifting songs to both sing and bounce along to. I try to stay on the rebounder for two songs, which works out between 6-8 mins. I’m hoping to slowly increase, but am mindful of my limitations and being gentle with myself. There are obviously days and weeks, when I don’t feel well enough to go on my rebounder, but on the days that I do feel up to it, I make sure I enjoy every precious bouncy moment. I also have to be careful as sometimes after a few minutes it aggravates a whiplash injury I sustained a couple years ago, so have to stop. But little by little is better than none at all! So with this in mind, my happy today is to be grateful to have had a short but fun bounce on my rebounder. I love everything about this! Just reading it has made me smile and smile. What fun! Next Next post: Day 64: Kindness message: found!